Acne is a skin condition that causes a variety of pimples, or comedones, such as whiteheads, blackheads or cysts. Some foods, such as dark chocolate, can trigger breakouts if you have acne; however, acne triggers vary from person to person. Dark chocolate also contains ingredients that are implicated in acne breakouts, such as sugar and fat. Cutting it out of your diet to get clearer skin won't cause any nutritional deficiencies. However, consult a dermatologist for advice on your specific problem. When sebum from oil glands in your skin and dead skin cells clog pores, or follicles, bacteria feed on the oil, leading to pimples. Excessive oiliness in your skin, slow turnover of skin cells, hormones and inflammation all play a role in causing acne and making it worse. No foods, including dark chocolate, cause acne pimples. Instead, food can exacerbate some of the causes of acne, such as oiliness in your skin and inflammation. According to the American Osteopathic College of Dermatology, AOCD, chocolate is one of the foods acne sufferers often single out as a trigger for their breakouts. In 100 grams of dark chocolate with 70 to 85 percent cacao solids, there are nearly 24 grams of sugar. It also contains nearly 25 grams of saturated fats. Sugar and saturated fat increase levels of insulin and, in turn, inflammation in your body, which can make acne worse. However, the AOCD point out that chocolate rarely is a factor in aggravating acne. If you are among the group of acne sufferers who is affected by eating chocolate, eliminating it from your diet could help minimize pimples. In a study published in the journal "BMC Public Health" in September 2009, researchers from the University of Oslo investigated the link between diet and acne and mental distress in adolescents ages 18 to 19, using self-reported acne through a checklist, questionnaire and socio-demographic factors. They found a significant link between frequent consumption of chocolate or sweets and acne in males. However, additional studies are needed to validate these findings. If you decide to stop eating dark chocolate to treat acne, you might need to wait up to six months before you notice any improvements. Keep in mind that other foods, including refined carbohydrates, dairy products, meat and any food that causes allergies, also might increase pimples. 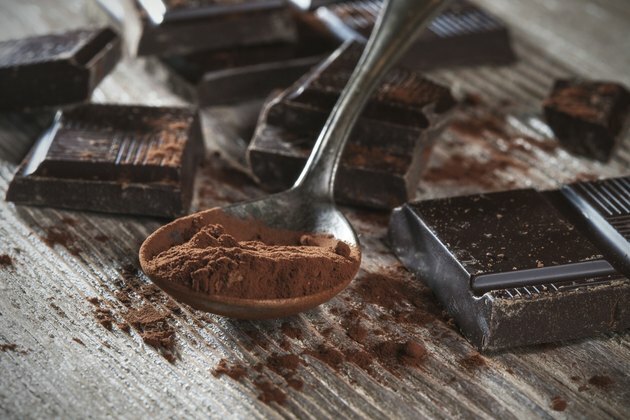 So eliminating only dark chocolate from your diet might not get the results you want. Keep a diary to track your acne breakouts after eating foods you suspect are triggers. If you have a medical condition, speak to your doctor before changing your diet.